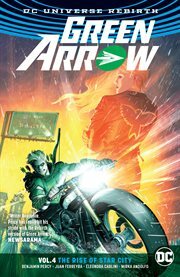 The item Green Arrow ;, Volume 4, issue 18-25, The rise of star city, Benjamin Percy, writer ; Juan Ferreyra, Eleonora Carlini, Mirka Andolfo, Otto Schmidt, artists ; Juan Ferreyra, Arif Prianto, Hi-Fi, Otto Schmidt, colorists ; Nate Piekos of Blambot, letterer, (electronic resource) represents a specific, individual, material embodiment of a distinct intellectual or artistic creation found in Kent District Library. Green Arrow's hometown of Seattle is facing the worst crises the city has ever seen: Planes are plummeting out of the sky, gigantic buildings are collapsing, and fires are rapidly spreading. As the death toll continues to rise, panic consumes the city. At the center of it all is a mysterious group of chaos-inciting criminals: the Ninth Circle. And they have Green Arrow dead center in their crosshairs. While Green Arrow forms a crew of superhero first responders with the indomitable Black Canary and eagle-eyed Red Arrow, Seattle continues to burn. Can Ollie and his team save the city while taking down the Ninth Circle once and for all? Or will the Ninth Circle complete their violent rampage and destroy Seattle-and Green Arrow-at long last? An iconic super-duo reconnects and takes aim at evil in GREEN ARROW VOL. 4! A milestone in the saga of the Emerald Archer from writer Benjamin Percy (TEEN TITANS) and artists Juan Ferreyra (NEW SUICIDE SQUAD), Eleonora Carlini (BATGIRL) and Mirka Andolfo (DC COMICS BOMBSHELLS)!